Entries from Digital Intelligence tagged with "smartphones"
Top UK brands are leading the way in Europe when it comes to mobile performance, with smartphones taking 50% share of traffic, according to new Europe-wide research. Are you most likely to use a mobile for Facebook, a PC for shopping and a tablet for Netflix? A study reveals which sectors are most dominated by the different devices in terms of the time people spend visiting them - and the answers aren't necessarily what you might think. Most parents believe children should be 11 years or over before they own a smartphone or tablet with internet capability, according to new research. 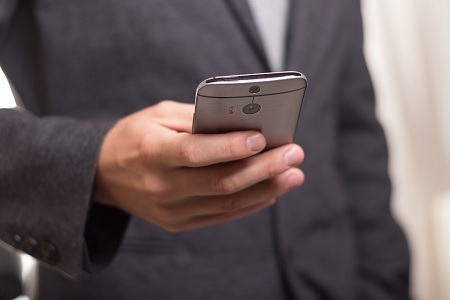 The mobile boom is changing behaviours with consumers in Mexico, with over 80% of Mexican mothers using their smartphone to chat, according to new data. Aluminium could give a big boost to capacity and power of lithium-ion batteries. As 2015 gets under way, Nielsen looks at some of the top trends in digital including the latest top U.S. smartphone apps and operating systems. Mobile strategies got a boost this month as Facebook's Hyper Local ads took geo-targeting to a new level. New research shows Europeans value their personal data at £140, but if you're a trusted brand looking to get access the price could be lower. For 2015 strategies, smartwatches are about to make intelligent homes even smarter, and connected cars will create a wealth of new touchpoints. Email us back for extra tips on what this means for your 2015 strategy. Google has revealed its latest line-up of Android mobiles and software, as the internet giant aims to attract a wider range of consumers away from rivals Apple and Microsoft. This month's round-up of the research, trends and case studies impacting digital marketing. Take a look and get back in touch if there's anything you'd like advice on about how it could impact you and your team. Apple has filed a new patent for smartwatch designs under the name ‘iTime’, fuelling more speculation that the electronics giant is making a leap into wearable technology. The U.S. smartphone operating system market has solidified into a two-horse race between the Android and iOS platforms, according to new research from comScore. Nearly a third (30%) of movie tickets are bought on mobile phones in the US, and 87% of movie watchers look up movies on their phones after seeing an ad elsewhere, according to new research from the IAB. Samsung has showcased its second attempt at smartwatches, with two new versions of its Gear range, running on its own Tizen operating system rather than Android. Google has revealed its latest foray into mobile mapping technology with ‘Project Tango’- a new smartphone with sensors that track the position of the smartphone in a full 3D space- with the added ability to map what's outside the phone. Coca-Cola has become the latest brand to use Apple's iBeacon in retail, a new tool that that can track and guide shoppers in-store. This chart shows the average monthly unique users for the top 10 smartphone apps in 2013. The Facebook app, which tops the chart, saw little growth over the year with a 27% increase from 2012. 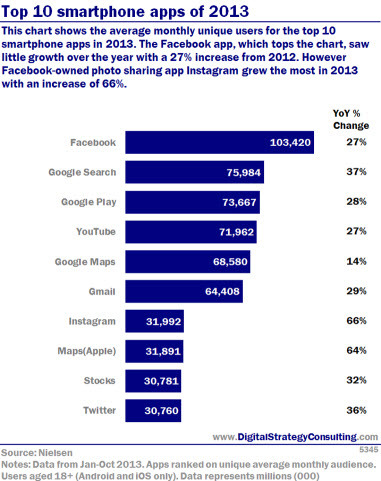 However, Facebook-owned photo-sharing app Instagram grew the most in 2013, with an increase of 66%. The number of text messages being sent in the UK has fallen for the first time ever as more people turn to Whatsapp and iMessage, according to new research looking into mobile trends. Apple has acquired SnappyLabs, the one-man app developer behind SnappyCam, a high-speed continuous shooting photography app for iOS. Apple’s share of smartphone sales has grown following the September release of the iPhone 5s and 5c, but its share of most major markets remains lower than this time last year, in the face of growing competition from rivals, according to new research. Vine has expanded its web features, as the Twitter- owned app looks to boost ways of sharing its 6-second videos. Over half (56%) of mobile online sales originating from a marketing email take place on an iPad, according to new research. New research into consumer attitudes to content consumption on their digital devices shows that seven out of ten smartphone and tablet users (72 per cent) expect the same quality of content experience across all their digital devices. Nike has launched a new version of its Fuelband device, as the sportswear brand looks to further expand into digital fitness.